The book Last Child in the Woods introduces its readers to the world in the present, a present in which we are experiencing a modern, fundamental disconnect with nature. This distancing from an unstructured experience with nature, is creating critical issues for our children. And it up to us, Richard Louv says, to save "our children from nature-deficit disorder" by finding ways to bring back the 'Nature' of open-spaces, where a child's imagination matches the freedom they can experience there. My childhood was spent growing up on the great plains of North Dakota, where I knew the joy of experiencing freedom in the wild outdoors. My father brought me a golden palomino 'Nokota' horse when I was just 7 years old. The horse and I grew up together, and we would race across the great plains for an entire day at a time with no fences to stop us. I agree with Richard Louv that we need to take a stand and find a new way of doing things (developers, city planning, designers, etc.) to ensure the health of our children, ourselves, and our planet. After enjoying Nature in the great outdoors, our bodies and minds are just better. When I have a problem to solve (artistic or otherwise) my favorite place to go is out into Nature. Whether walking along the beach in So. Cal., or through one of our desert canyons, just being with Nature feeds creative problem solving and physical well being - what could be better? The author's message reminds us that we should make doing so a priority, and to invite others along whenever possible. I thought about the workshops I host at a local nursery (creating container gardens, teaching plant care, living frames, etc.) and how these classes are an opportunity to experience Nature on some level. Granted it is a 'constructed environment' in which the classes are held, and it's certainly not a 'wild' experience (tho. 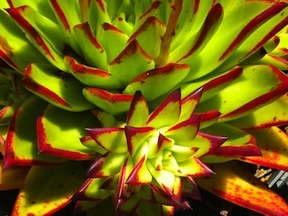 the succulents we use are quite wild looking). We are all playing with Nature during the workshops & we do have a direct experience with the soil and the living plants. An experience like this could help to remind us how much we enjoy the land, the soil, and living things - voila. Who knows where this might lead? And in the 2nd book, The Nature Principle, Richar Louv points out that adults suffer from 'it' too. Of course we do! I agree with the message in both books, it's importance to us, no matter our age, career, etc. The message seems so obvious, but when have we really sat down and considered what it means? My love of nature has taught me this - the more often you find ways to be with Nature, the more likely you are to end up making the experience inseparable from the way you live your life. It just feels right, and so it is.